Kettlebell Kickboxing (KB) was created by martial artist, kettlebell expert, and fitness professional Dasha L. Anderson. Dasha used her Master’s Degree in Exercise Science, her Russian kettlebell heritage and her martial arts expertise to combine her knowledge into this one-of-a-kind fitness method. 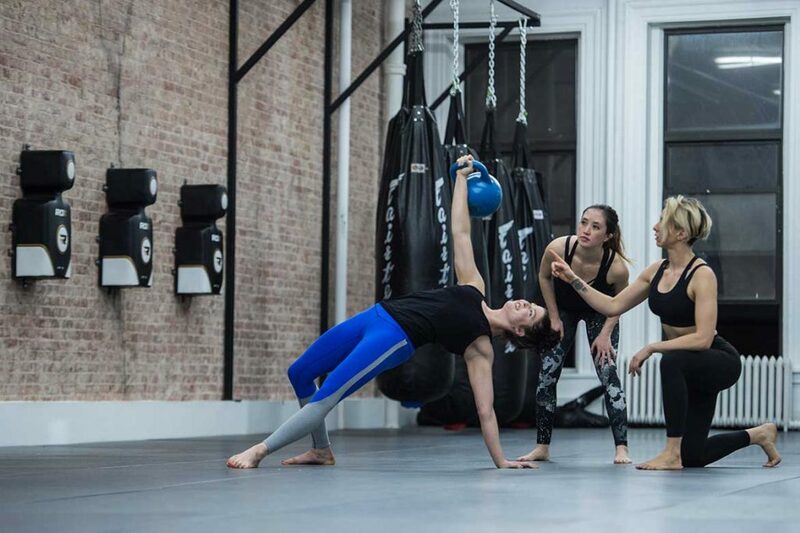 Initially KB started as a New York City fitness class, a way for Dasha to combine the mobility, agility, and longevity principles of martial arts conditioning with the power, strength and versatility of Russian kettlebell training. As the NYC flagship class grew, so did the KB brand. Today KB is known for classes offered world-wide by certified KBIA instructors. Our NASM, ACE, AFAA and CanFitPro accredited Kettlebell Certification Programs, and for our 6 home fitness programs, including a weight-loss, strength, and mobility series. By and large, most of us start off life as healthy individuals. We are able to move pain free and enjoy our lives by way of our bodies. The quality of our movement, our energy levels, the strength and ability of our bodies is an essential part of longevity, neurogenesis and the quality of our life. Health is crucial to the quality of our life. How we get and stay healthy determines whether we will become dysfunctional or successful. Over all, longevity and quality of motion should be the primary goal of exercise. Exercise should help enhance our lives by being measurable, sustainable, prescriptive and progressive. Exercise and training should not be sporadic, or just plain old ‘difficult’ without following the correct human movement structure or scientifically based programing. Kettlebell Kickboxing DVDs and classes, as well as the KBIA Instructor Association take the statement above very seriously. We believe in creating a like-minded and diverse community of individuals that can feel both supported and inspired through every step of their fitness, health and professional journey. Our mission is always to connect mind-bod-spirit, and our roadmap to getting there is always by enforcing quality of motion through the very best scientifically founded education. Women and men from around the world have taken KBIA instructor certifications in order to start a KB class or open their own KB studio in their city. New Zealand, Canada, United Kingdom and Japan are just some of the countries that have Certified KBIA instructors and classes. The Armed Services YMCA has made Kettlebell Kickboxing a class offered to their veterans. Once you make a decision to become a KBIA Certified Instructor, you can use the KB logo, credentials, and knowledge to open a studio, start a class, create a community or offer your KB knowledge to your private clients. With no franchising fees, yet all of the support you need through our KBIA Instructor Association portal, KB is yours, and the opportunities for you and your clients are limitless. Kettlebell Kickboxing has been host to a large variety of special fitness and charity events. We work with brands on launches and brand openings, charity, and education events. Past events and work have included lululemon, Nike, Atkins, SELF magazine, Victoria’s Secret Sport, Armed Services YMCA, PIX 11 Health, and NYU and NYITTech Institutions. We have six unique and highly specific home fitness programs, each of which comes with a program guide and a sustainable nutrition program to maximize your goals. Over 120,000 people world- wide have used our programs to get fit, healthy, and pain free and to maintain those results without the hassle of diets or hours at the gym. What is the point of working out if you can’t move with quality and if you can’t live pain free. Kettlebell Kickboxing uses the kettlebell’s unique high-intensity and mobility, yet low impact training to reconnect the body and help fix muscle imbalances, getting our clients and KB students out of pain. By following our programs, you will learn how to set measurable weight-loss, fitness, strength, and health goals, and you will see results. Kettlebells are an art form, and to teach them correctly you must learn the art. To teach fitness, you must understand the science. To transform the body, you must understand how the body works. To transform lives, you must be knowledgeable in creating measurable programs and exercise structures. KBIA will provide that for you and your students/ clients. Our entire module is based on facts and science. Exercise shouldn’t take up your entire day. Training should be efficient and effective, and it should produce results.